Northern Virginia traffic may be the target of many jokes—even his own—but to Gov. 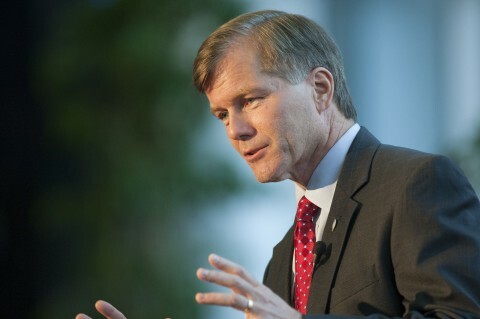 Bob McDonnell, the area’s congestion is no laughing matter. The governor stopped by a breakfast held by the Catholic Business Network June 28 in Herndon, where he spoke candidly to a small group of businessmen and women and several Virginia government leaders about the hurdles still blocking the area’s transportation flow. Despite his joking banter, McDonnell got down to business detailing his past victories: A bipartisan-supported legislation to pump nearly $4 billion into roads, rail and transit within three years and without a tax increase; balancing the commonwealth’s $4 billion deficit by implementing a hiring freeze and cutting funds in certain areas such as education and healthcare; and decreasing Virginia’s unemployment rate from 7.4 percent at the time of his 2010 inauguration to its current rate of 6.1 percent. He lamented the nation’s trillion-dollar debt, its deficit spending and its tax structure, of which he said only half of Americans have any material input. He warned of increasing competition in the global markets of China, Korea and Japan – nations that are known for their incredible work ethic and their recent embrace of capitalism. Before tackling the nation’s problems, however, he will continue to hone in on solutions to Virginia’s current issues. Virginia is consistently ranked No. 1 or No. 2 by all the major ranking agencies for its business-friendly environment, he said. This gives him the tools he needs to attract large corporations to the commonwealth. “As long as California’s going to chase businesses out, we want them to come to Virginia,” he said. That little nuisance of congestion that just won’t go away, however, has ranked Virginia third in the nation for its congestion rate. This kind of title could clog the commonwealth’s potential for attracting new businesses. McDonnell hopes to free up Northern Virginia’s transportation infrastructure through his transportation plan, however, which will put many contractors back to work. “You’re going to be complaining about construction, not congestion, I hope that’s OK with you,” he said.